I have been trying to talk my girl into a fairy tea party sort of birthday party for the last couple of years, mostly because of the tiny food, but she has been staunchly disinterested. Last month, though, her brother was in a school production of A Midsummer Night's Dream, & she was glued to her seat with wide-eyed fairy love the entire time (2 hours!). So then there was plenty of fairy talk for the next few days, & one day in the car I said "You know what I think would be fun to do sometime? Have a fairy party." And she said "YES! FOR MY BIRTHDAY!" And I said "Oh, wow, that's a terrific idea you just had!" And then, after a triumphant phone call to my husband in which I gloated about having PUT ONE OVER on my four year old, I immediately started plotting. with her red bow in back. She took it for a test run this morning, & it seems to hold up ok. This one, she says, is "for regular," when she's a "workity fairy," which is different than the fancy birthday party fairy, & which implies that she has BIG PLANS for her fairy wardrobe. Probably I'm going to need some more tulle. Hee, hee. That is so something I do to my daughter. Of course, this year I think she pulled one over on me since her party is going to be at the swimming pool. nice trick! if it is anything like here, one day in the next six months he will never again be disinterested and will think you are the smartest and the fanciest and will want to do everything you do all the time and follow you around like a hollywood stalker. it's not a bad gig, though I find that the constant scrutiny is kind of wilting. I envy you...boys won't do fairy parties...though my youngest invited a girl for a tea party when he was 4. That's about as close as I ever got to girly. (He's 17 now and would die if I reminded him.) 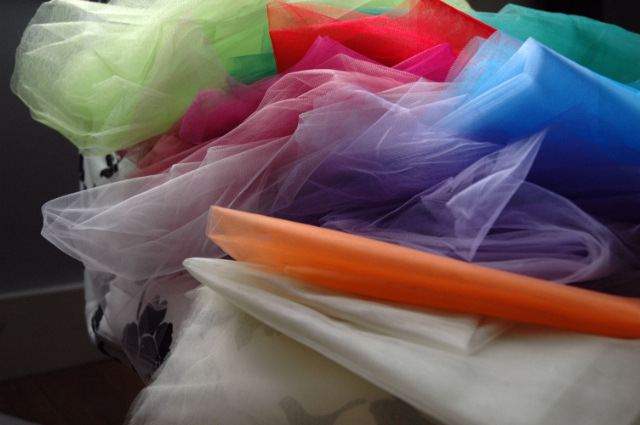 Buy loads of tulle and have a ball. I'm so jealous! 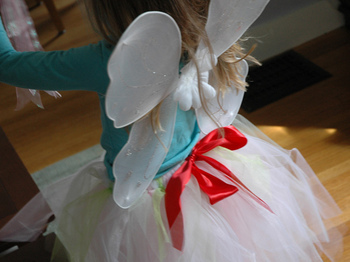 I so want to do a fairy party but my kids will have none of it. Maybe I'll try some of your genius logic to nudge them a little. Looks great! Nothing like putting one over on them in our own creative way. Oh, how I wish I was invited to a fairy party! Tiny food. Tulle. Just perfect! good job on the trickery and the skirt! we had a fairy party for jane one year. the girls decorated headbands as an activity. we used lots of tiny petals off of fake flowers and sequins and beads. it kept them busy and was a fun favor to take home with their skirt. More tulle and I imagine glitter too! Darling photos! That is soo adorable..It's going to be a great party.. So fancy! 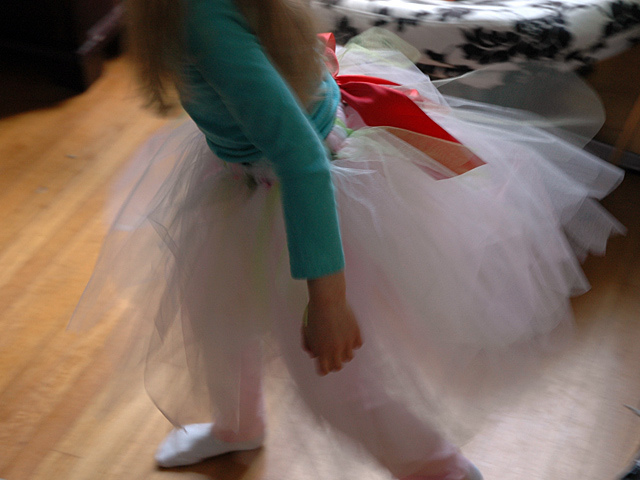 Gotta love the tutu! OH, I so wish my girls were young enough to play fairies again!!! 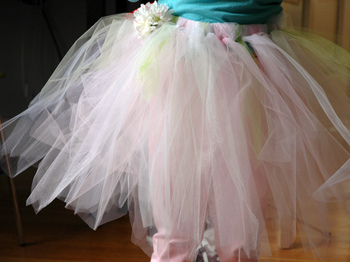 Love the tutu! We are having a fairies and pirates party for my 4 year old this year (boys are invited). I am also all for unnecessary serging! it's not a bad gig, though I find that the constant scrutiny is kind of wilting.